Back in the days when I first started writing this column and we were in the grip of seven day a week retail and mailorder plant supply, I used to despair at the numbers of well-heeled women in search of plants for their white garden. Mostly from Remmers, dear, and most had been to the ultimate white garden – designed and planted by Vita Sackville West at Sissinghurst in England. It was seen as the benchmark for restrained style and class and all wanted to emulate that standard. So all plants had to have white flowers and preferably be scented. Yellow stamens were permitted and cream was allowed but no other colour in the flowers. Fading out to white fell short and white flushed pink flowers were usually rejected as impure. There were rules for foliage too. Green was fine, silver foliage even better. Variegations were acceptable as long as they were white and green with no yellow or red. Apparently the secret of the white garden is revealed at night when all those pure flowers light up under moonlight to glow with ethereal beauty. Experienced gardeners realise instantly that this means it needs to be a summer garden because who wants to go out in winter or early spring to see the glowing white rhododendrons and camellias but not many white garden devotees of the early nineties were experienced. I recall reading a critique at the time that far too many of the white gardens were thrown together solely on the basis of colour. As long as it was white, it could be included. Gardens were criticised for the lack of thought given to planting combinations and inappropriate conditions for many of the plant subjects. When we finally visited Sissinghurst, I was excited at the prospect of seeing the ultimate white garden put together with skill – where plant composition, shape and foliage combinations rule supreme, without the distraction of colours beyond white and green. Alas I was underwhelmed, disappointed. It rather looked to me like plants selected solely on flower and foliage colour bunged in together. So much for setting the standard. It may well have been different in the original days of Vita Sackville-West but in 2009 it didn’t quite cut the mustard. Colour and flowers hide a multitude of sins. 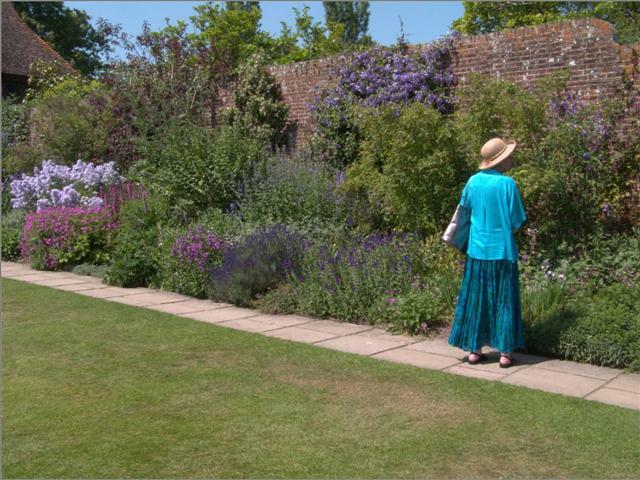 The purple border at Sissinghurst was far more successful on the day we were there and that in part could be attributed to the huge range of tones in blues and purples. There is not a lot of variation of hues of white and cream so it is harder to get visual oomph. I suspect that monochromatic garden schemes are often the refuge of less experienced gardeners but in fact they require considerable knowledge and skill to get them looking good. They are not actually monochromatic because gardens have green as a base colour but that is generally treated as colour neutral. If you garden only with foliage or with foliage and only one additional colour, then form and texture are your tools and the plants you chose to complement each other and to fill the picture become critical. At its best, it is a restrained and disciplined approach to gardening which can be very restful to the eye. More often, alas, it is a hodgepodge – sometimes a pretentious hodgepodge – or downright dull. This entry was posted in Abbie's column and tagged Abbie Jury, Abbie's column, colour in the garden, garden colour schemes, white gardens on 21 May 2010 by Abbie Jury.